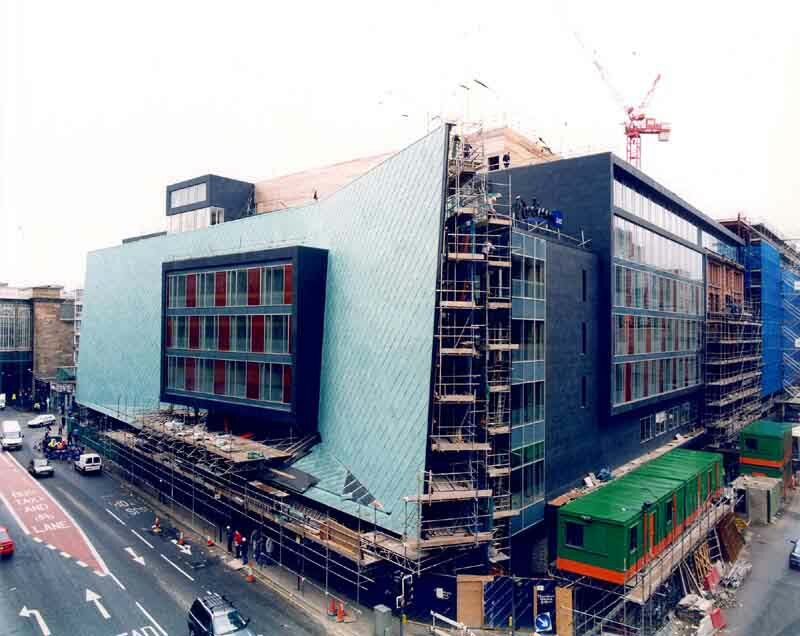 In 1998, gm+ad architects were asked by London based site owners Pelham Developments to take part in a limited competition involving four other practices and prepare design proposals for a five star hotel on Argyle Street, Glasgow. 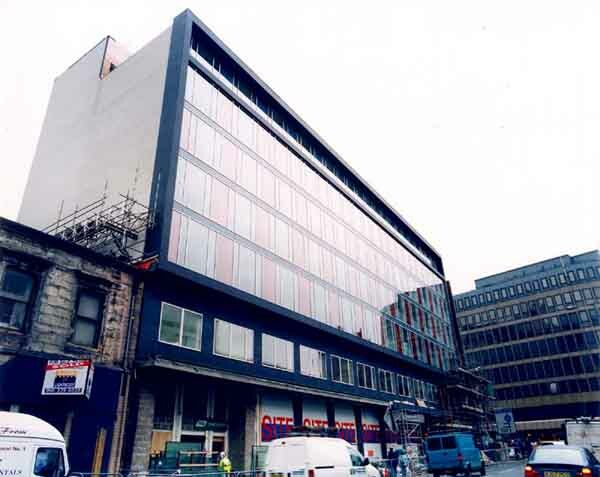 At the time when the Glasgow Development Agency stated that there was a shortage of top quality hotels in the city centre and when Glasgow’s conference centre market was growing. The site to the west of the Heilanman’s Umbrella had been derelict for some time and various practices in the city, including BDP Architects, had already tried to kick start proposals for commercial developments on the site and even another hotel but somehow things could never stack up financially. Now with the publication of the GDA report and the interest it generated and the completion of the first part of Atlantic Quay, Pelham thought that the time was right to try an sell the site to a potential hotel developer and they needed a scheme to hang things on. 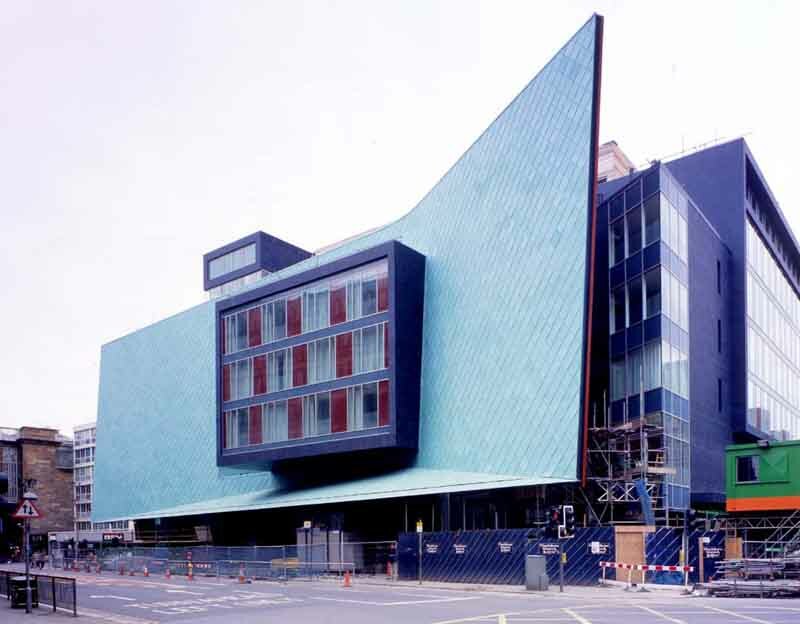 gm+ad architects won the competition with an early version of the copper-fronted Radisson Hotel Glasgow and became preferred architect. To help get things moving and because of gm+ad architects’ good relationship with the city planners, gm+ad approached Glasgow City Council with their ideas and they were prepared to write a letter to Pelham which stated that should gm+ad architects present their proposals to the city they would be positively received and likely to obtain planning permission. On the basis of the gm+ad scheme and this letter of recommendation, Pelham started to look for buyers for the site. 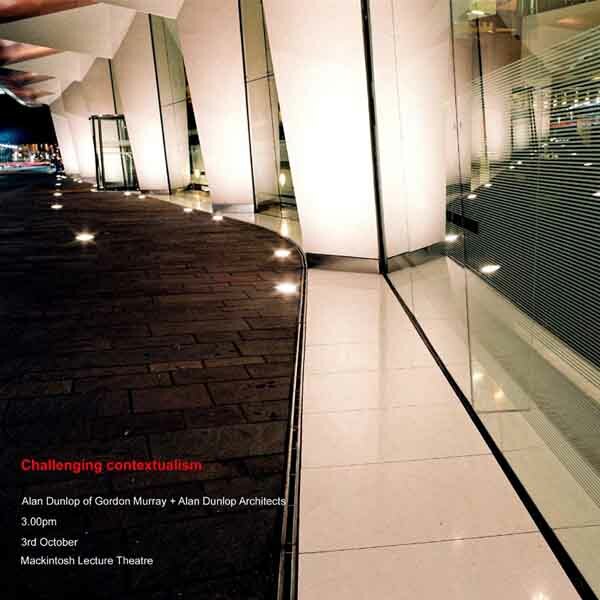 In 1999 gm+ad architects were interviewed by Marylebone Warwick and Balfour, a London base development company looking for opportunities to build in Scotland. 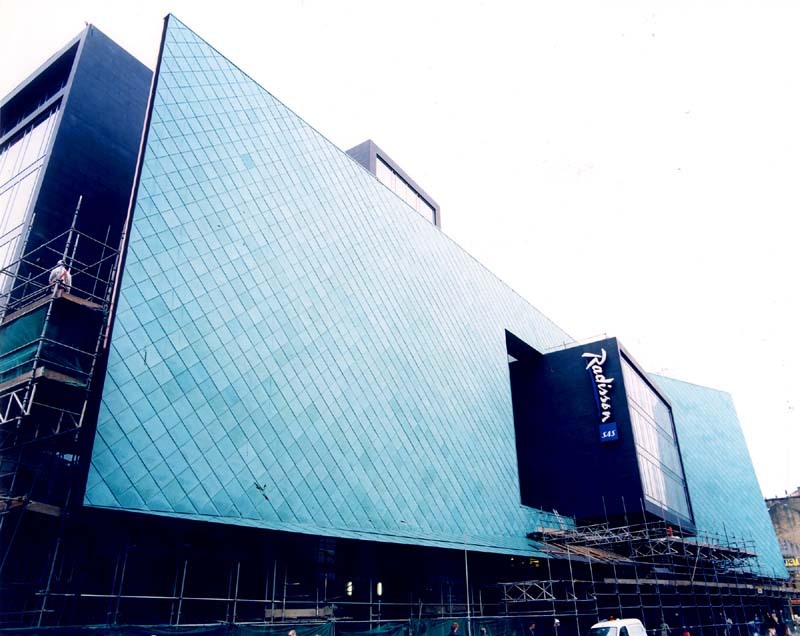 They liked gm+ad’s work and talked to the planners and gm+ad architects commissioned for the Radisson SAS Hotel Glasgow late in 1999 to build the hotel. Anyway, we prepared design proposals for the site, for originally a 300 bedroom five star hotel, which by our early calculations could potentially be eight storeys high. 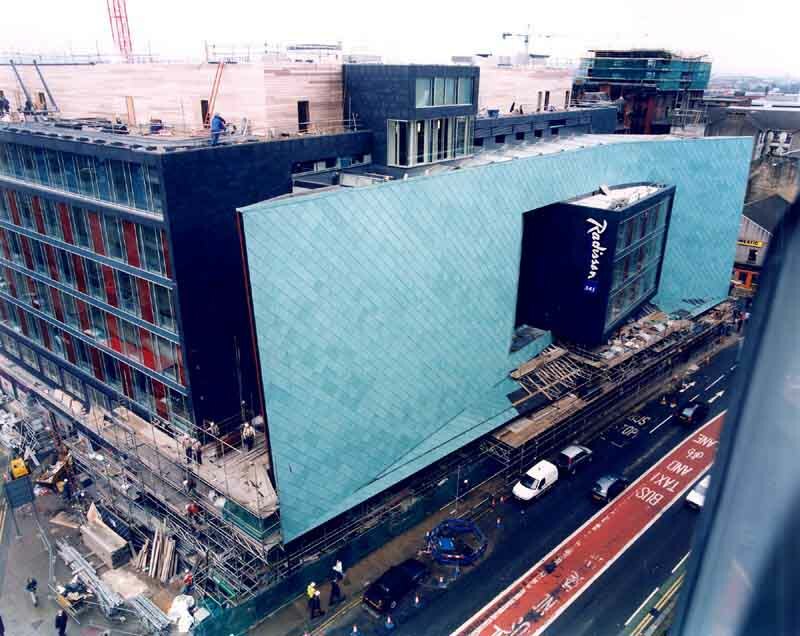 When Radisson were contracted as operators this was reduced to 250 beds and to a four star delux standard. 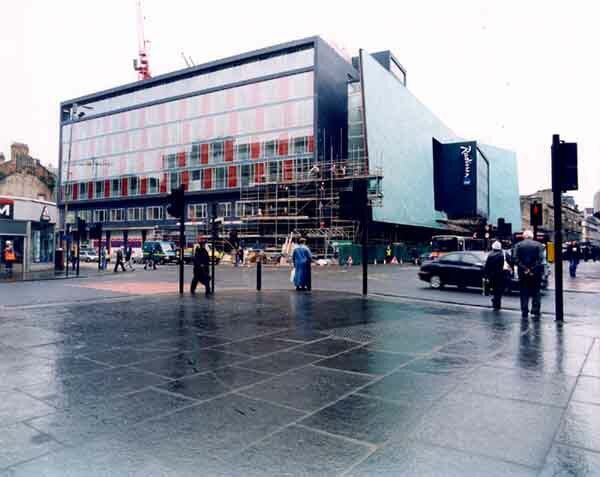 Although the west end of Argyle Street was seedy and our site derelict we recognized that Argyle Street was one of the city’s oldest thoroughfares and still retained some character and a median height of twenty metres which was evident right through the street from Trongate to Anderston and including the Heilanman’s Umbrella. It is my understanding that this median height was set by the extent the fire ladder could reach in Victorian Glasgow. 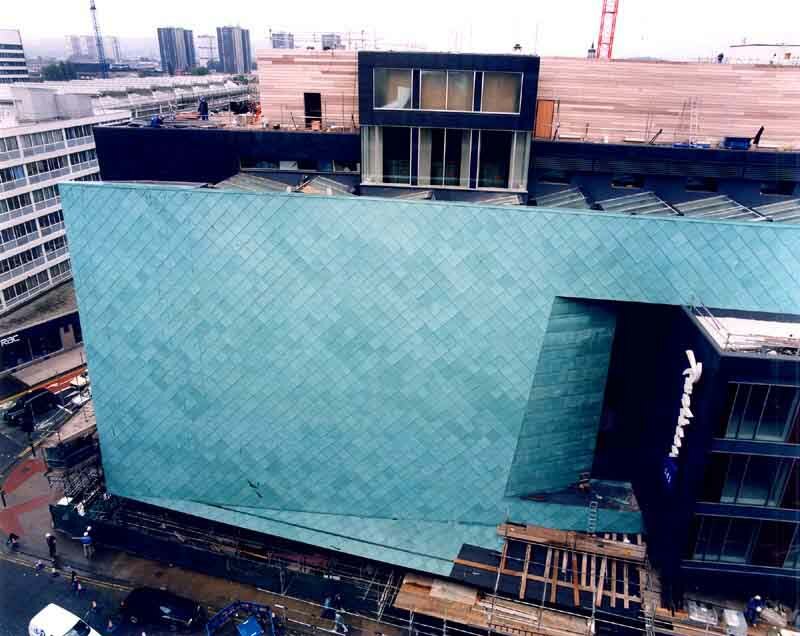 The copper screen was a device which would allow us to respect and continue this median height and the scale of the thoroughfare but build a potentially seven or eight story building behind. We chose copper for the Radisson Hotel because we wanted to use an “indigenous” Glasgow material but in a dramatic way and we were always interested in Gillespie Kidd and Coia’s use of copper over large areas, particularly Our Lady of Good Counsel in Dennistoun and also Aalto’s technical college in Helsinki, which we use in our presentations. A lightweight and engineered foil to the buildings frontage would also allow us some flexibility of form and the Radisson elevation could potentially pull back from Glasgow’s grid line at the entrance to the hotel and help us create a “public” space in-between. 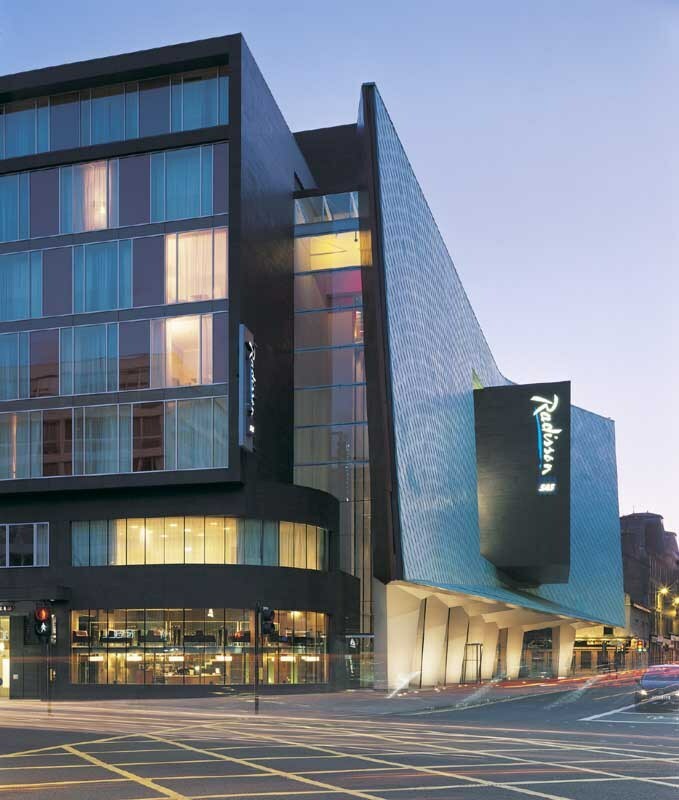 As a counterpoint to the flexible and lightweight screen, the main part of the Radisson hotel was to be solid and monolithic but again we wanted to use a native material and something other and more interesting than sandstone, so slate became the obvious answer. Radisson Hotel bedrooms had to have an outlook, so either looked onto the adjoining streets or into an internal courtyard. 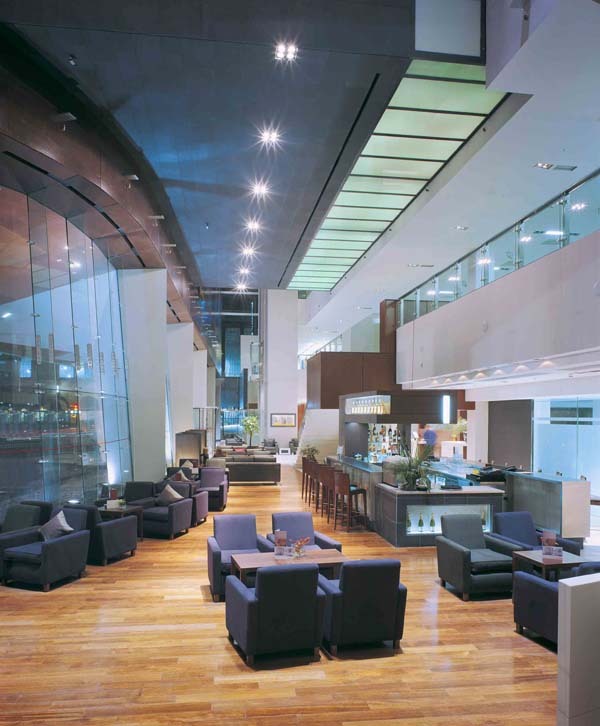 In between the monolithic residential accommodation and light weight frontage we squeezed an “internal street” atrium containing the Radisson hotel’s reception and bars and restaurants, so that this space could be something more than the conventional square and regular atrium space. The back of the copper wall was facetted so that we could view slithers of the Heilanman’s Umbrella and an interesting wee classical building on the north of Argyle Street from various points in the Radisson hotel, like from the main feature stair. 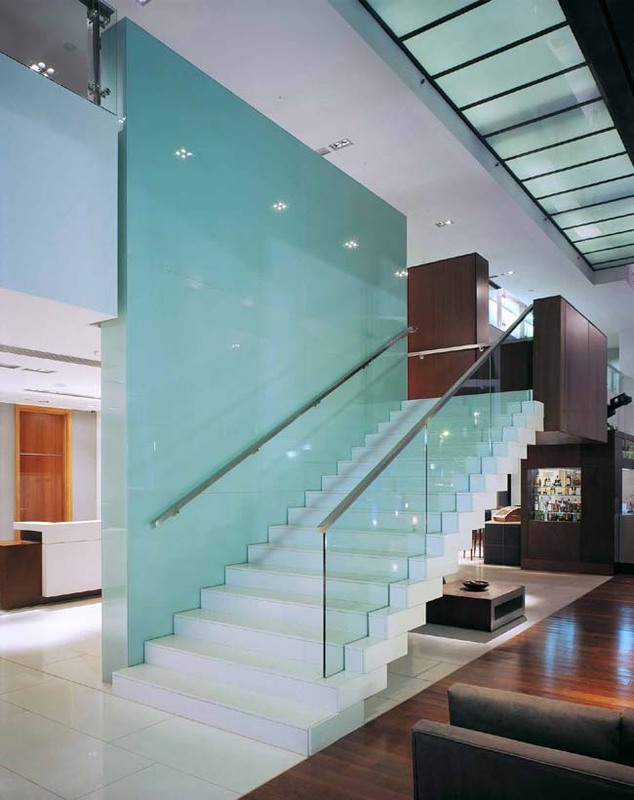 This five-storey space is naturally lit from above and feature lifts move through the space and guests can look into from the corridors leading to their rooms. 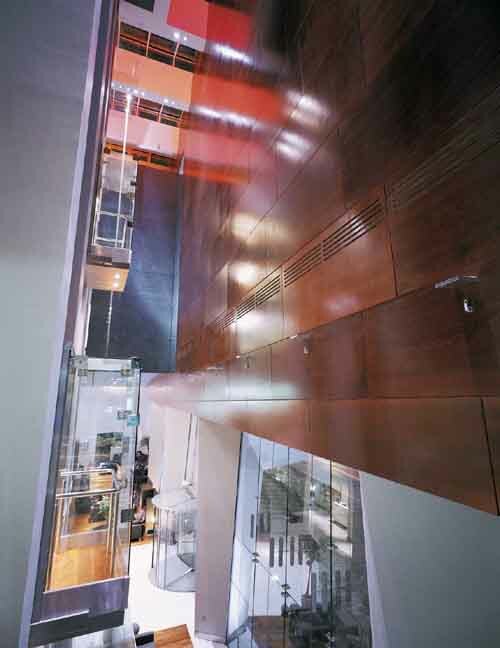 As the curve of the copper was played against the line of the Glasgow grid, a suite of specialist rooms cantilever through the copper wall to form a dramatic set piece in the elevation and you walk over a glass bridge inside the Radisson hotel to get to these rooms. 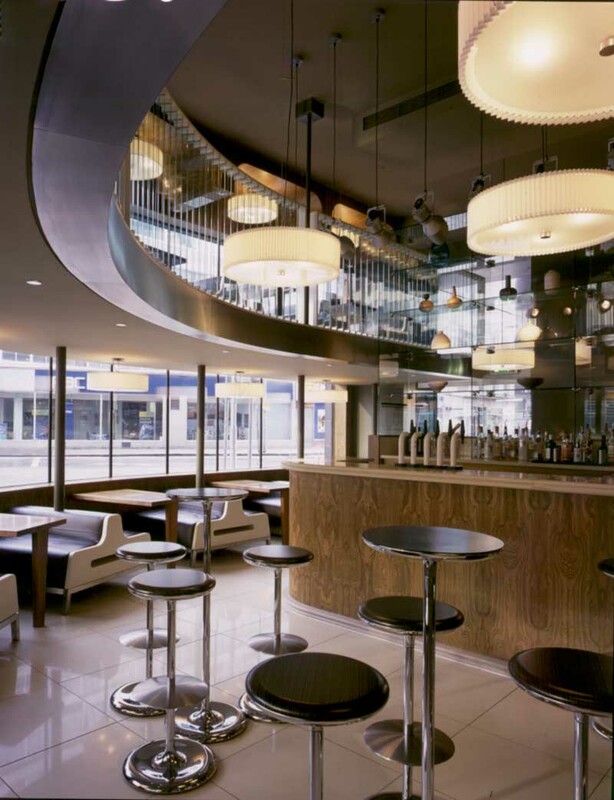 At the base of the Radisson hotel we wanted to encourage activity and to have, if possible, people other than guests encouraged to use the facilities and therefore give some life to the street, so we designed bars and restaurants which could be used by everyone. The City Council liked this idea very much and thought, as we did, that such a proposal could help reconnect development on Atlantic Quay and the Broomielaw with the city center. Also helpful and important was the Grade B listed Baroque building at 62 Robertson Street which we felt would help a re create an interesting street composition but would also set the floor to ceiling heights for the Radisson hotel. 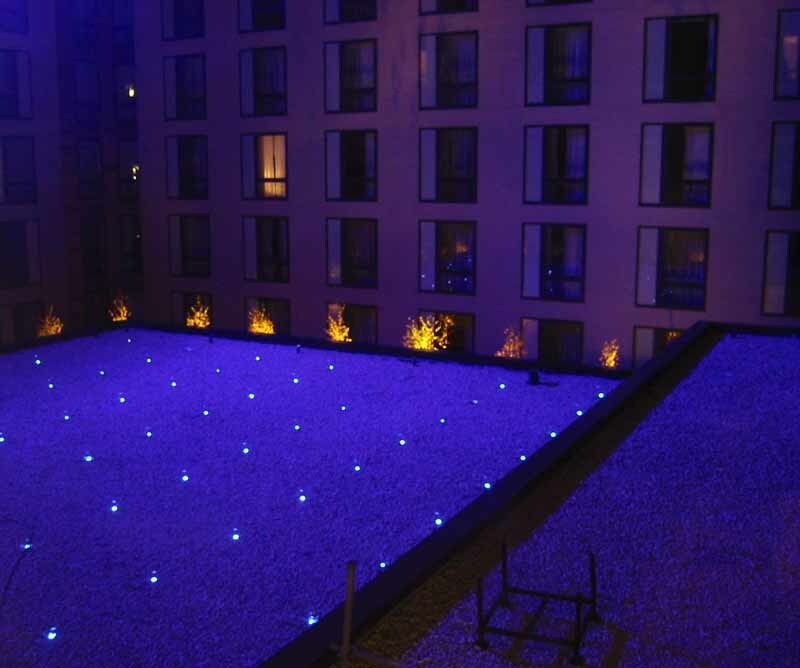 Consequently the hotel bedrooms are much higher that you would normally expect in a new build hotel but you therefore get a real feeling of space and because we have floor to ceiling windows all the rooms at the Radisson are filled with light. “This new five star 250 bedroom hotel for London based developer MWB is currently being built in Argyle Street, Glasgow at a cost of £30m. It will be operated by Radisson SAS and will be their first new-build project in Scotland. A curved copper wall continues the street line of Argyle Street, one of Glasgow’s oldest thoroughfares, and provides a dramatic frontage to the hotel. Copper is one of the Glasgow “native” and historic building materials, used here as a foil to the six floors of hotel accommodation. 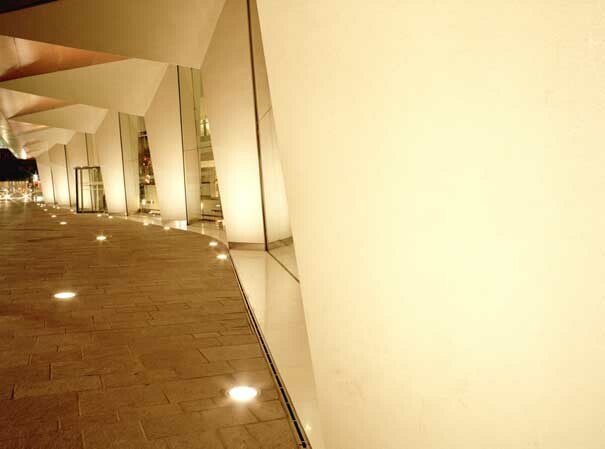 A naturally lit internal “street” containing the reception, function suite, cafe and bar spaces runs between the copper wall and hotel accommodation. 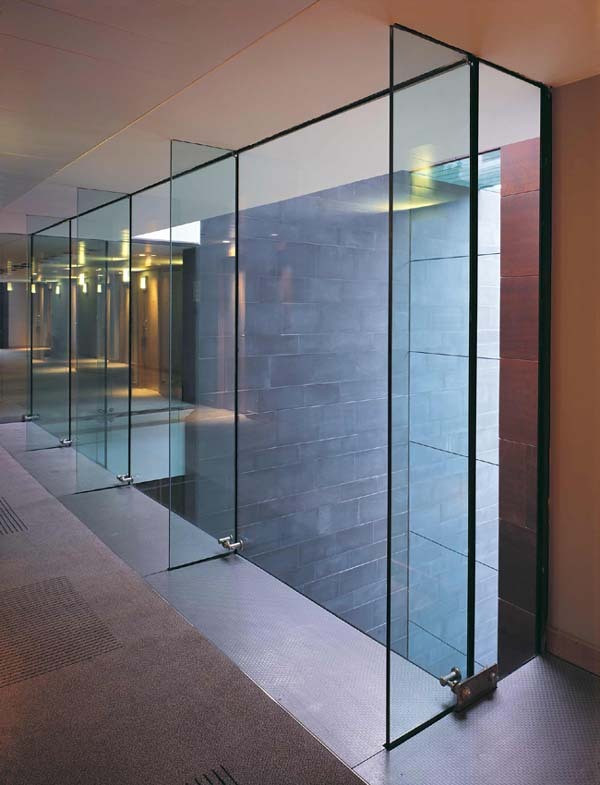 A special suite of twelve rooms cantilever over the street and extend through the copper wall to Argyle Street. Previously neglected frontages on Robertson Street and Oswald Street are brought back to life with fine dining restaurants, bars and leisure uses. The Radisson SAS Hotel has clearly aroused some popular emotion. It is big, bold, perhaps even brash but it does respect the city block, it understands the pavement, on closer examination it presents a clear concept underlying its planning. 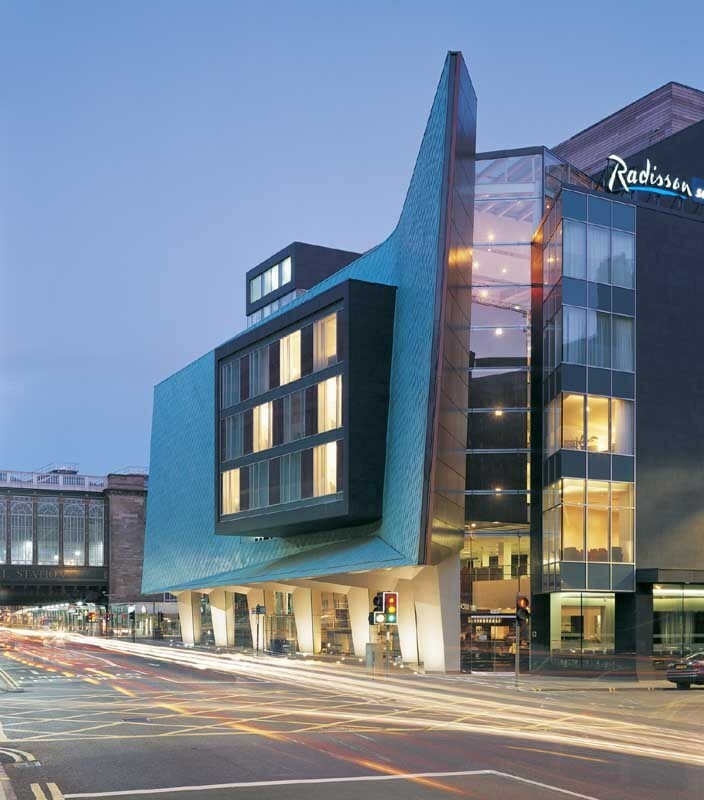 The Glasgow Radisson Hotel’s various parts are made visible in a tall top-lit space rising up behind its ‘signboard’ street façade, its fashionable public parts clearly visible and usable at ground level and the bedrooms and business facilities above innovative and excitingly detailed. The Radisson SAS in Glasgow is featured in a new and beautiful book on top hotels by Laurence King Publishing. The book, titled 21st Century Hotel, is due to be published on April 25th and it contains information, comment and photographs on selected international hotels. 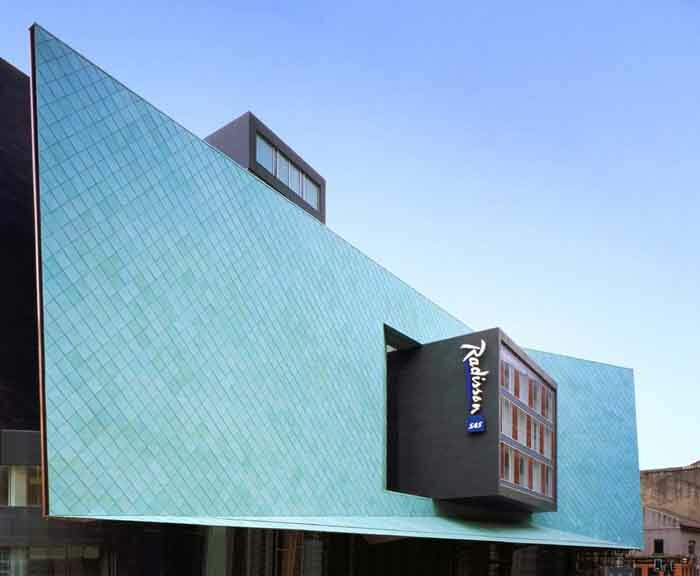 The Radisson SAS sits alongside hotels in Times Square, Tokyo, Paris and San Francisco, in fact all of the great cities in the World. 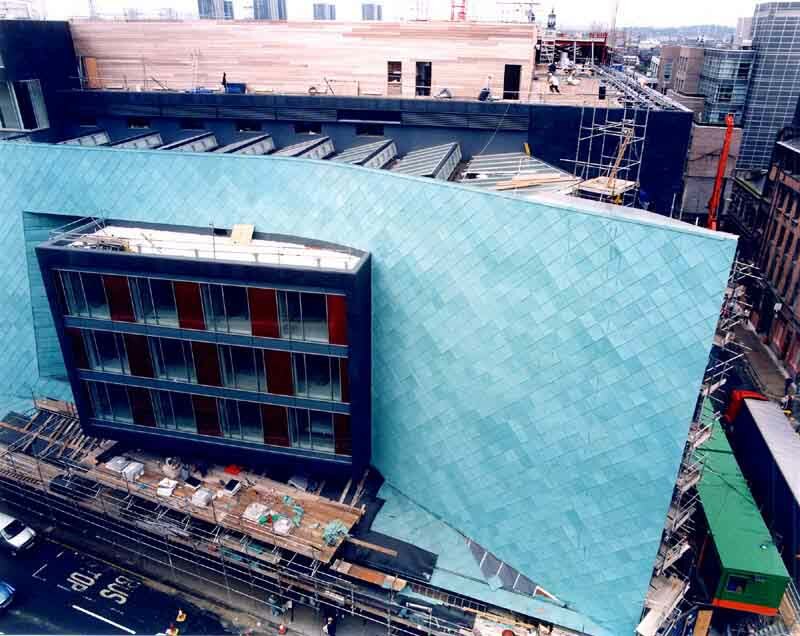 It is one of only five UK projects. The publication has an editorial and commentary written by Graham Vickers, a well respected writer on design, architecture and marketing. Of the Radisson SAS on Argyle Street he writes: “it’s architectural impact is so strong as to provide the primary focus of interest. Here a whole design approach is flagged by the building itself, which successfully juggles with a range of practical issues and restrictions to create a strong statement reflecting something of the spirit of Glasgow and it’s history without ever being reverential or resorting to pastiche” He adds ” That appeal resides in the hotels public spaces and, perhaps most of all, in the external impact of this striking, land locked hospitality vessel with its striking green prow”.